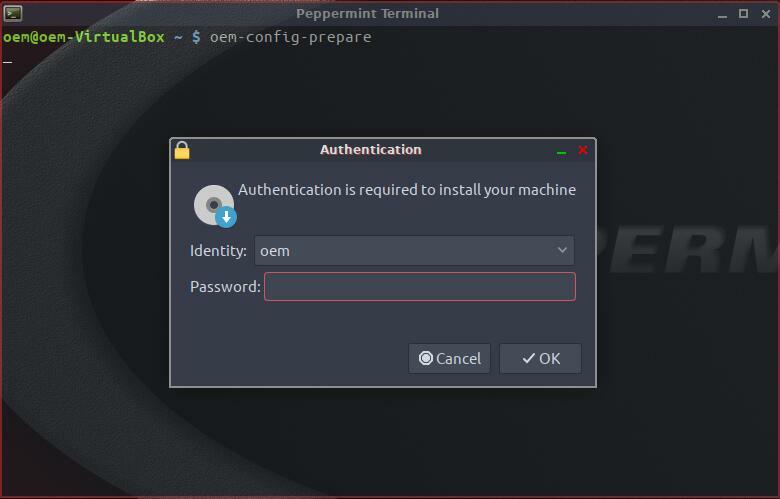 An OEM installation is a special type of installation that allows you to pre-install Peppermint on a PC and ship it to an end user with modifications (such as added software), and where on first startup the user will be prompted for account creation details (username / password), language, and keyboard layout. It saves you having to ship PC's with a pre-configured account, and allows you to modify the default applications. 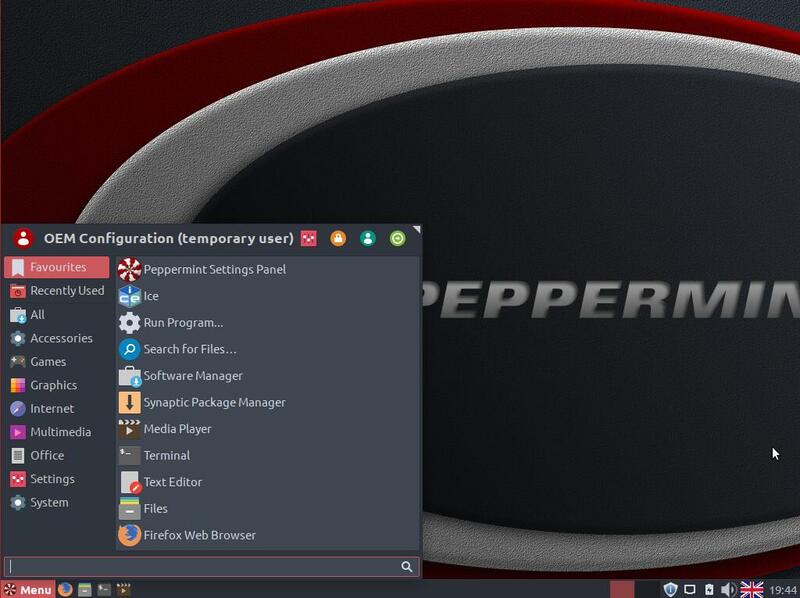 Please be aware this guide currently applies to the Peppermint 9 Respin-2 (20190102) ONLY. 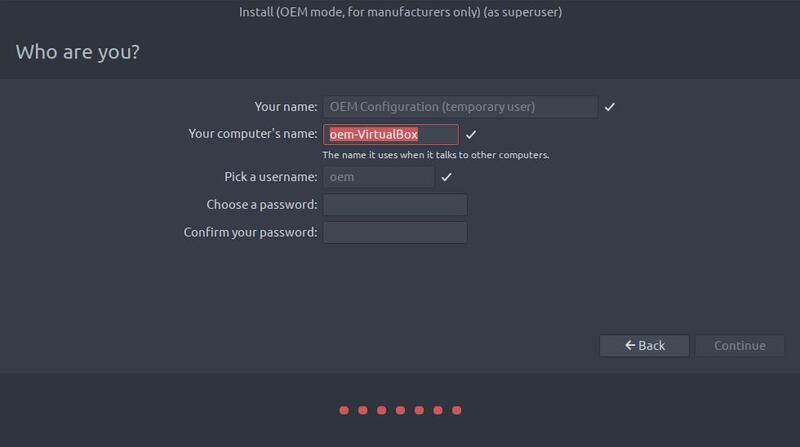 Select "OEM Install for manufacturers" .. and hit Enter. You will be asked for a name for this batch of computers .. you can enter anything you like here, such as the name of the business you are shipping to, but it can be anything .. and click "Continue". 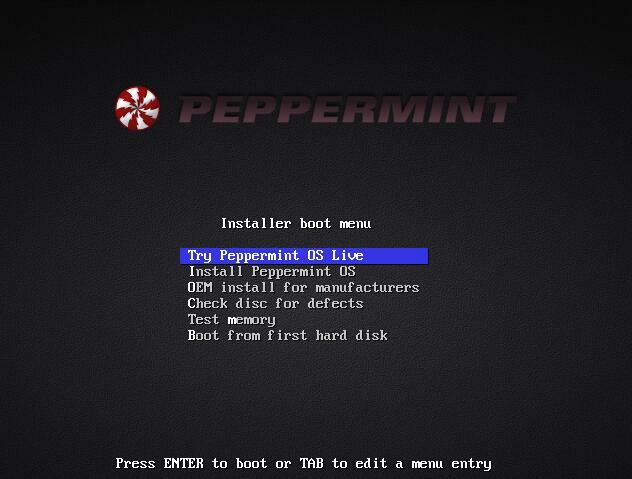 You'll then be walked through a standard installation of Peppermint until you get to the screen below .. enter a password (doesn't matter what it is because this 'oem' account will be erased later) and click "Continue". You'll see the standard Peppermint slideshow, and then the 'restart' dialog below will appear .. click "Restart Now". 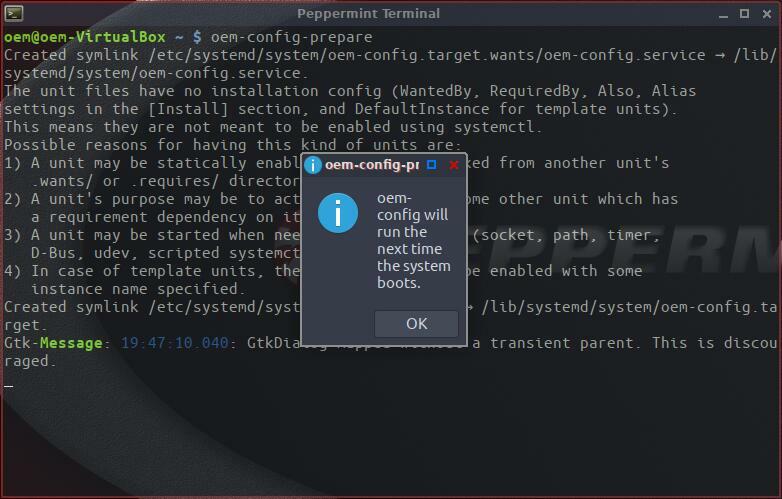 The system will then reboot into a standard Peppermint desktop, where you are logged on as "OEM Configuration (temporary user)"
At this point you can make any changes you'd like the end user to have .. eg. install libreoffice, gimp, etc. 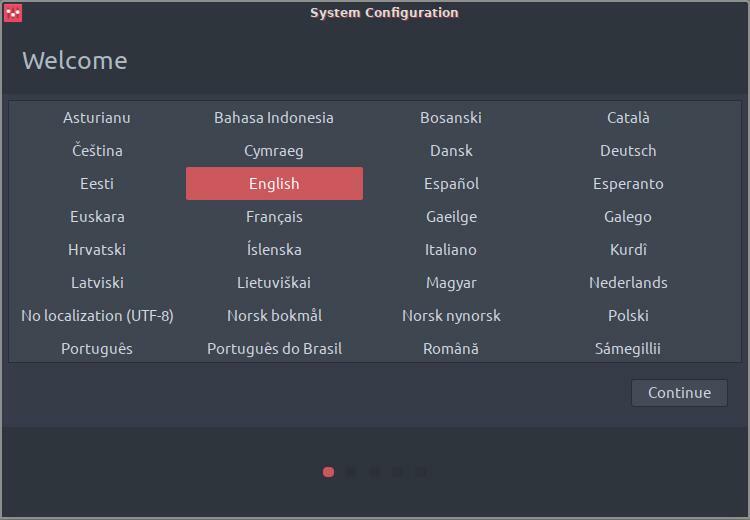 enter the password you set earlier for the 'oem' temporary account .. and click "OK"
You can now shut the PC down, remove the installation media (LiveUSB/LiveDVD), and ship the PC to the end user. When the end user has entered their details they'll end up at a working Peppermint desktop logged on with the username they created. 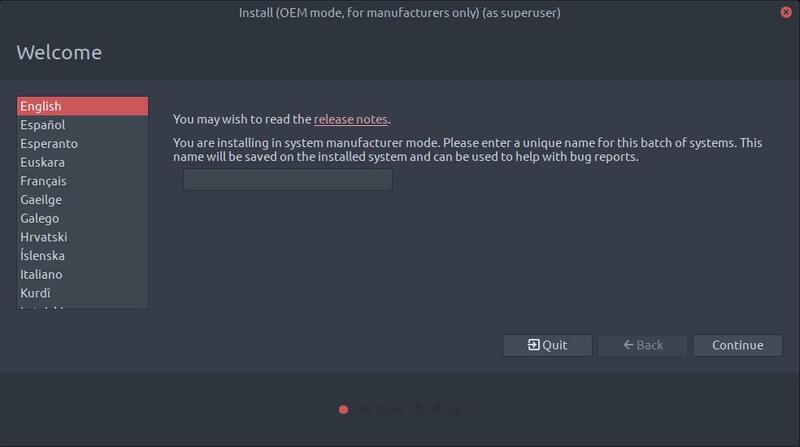 The temporary 'oem' account will have been automatically deleted, the desktop icon removed (if it existed) and the oem-config and oem-config-gtk packages will have been uninstalled.